The neck can begin to show age faster than whole face and many times patients only need a neck lift, rather than a full face lift. Aging does not always determine the need for a neck lift, but rather having lost considerable weight or it may even be hereditary. 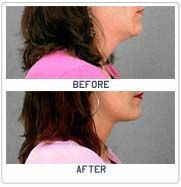 Many patients choose to have a neck lift with their face lift procedure. 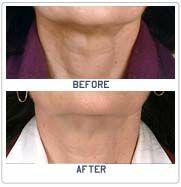 Neck Lift is a surgery designed to reduce the loose look of sagging skin in the neck area and under the jaw line. Neck Lift is an operation that usually takes 2 hours to complete using a general anaesthetic and normally includes an overnight stay at the hospital. Your expectations need to be realistic. Most patients are pleased with the outcome and find they gain a feeling of increased self-confidence especially when wearing can those more revealing clothes. The overall achievement will be having a completely natural look that gives the impressions you have lost weight and/or look younger. Unfortunately, all surgery has risks and complications. With platysmaplasty, these include an allergic reaction to the anesthetic used and infection. For risks related to anesthesia - please see our Introduction To Anesthesia section. There could be asymmetry, general dissatisfaction, hematoma or seroma, lumpiness, and/or mottling of the skin. Cording, laxity relapse of the platysma and skin of the neck. Numbness is possible, it usually subsides within the first few weeks but it may become a permanent issue. Puckering of the skin may occur and deeper than desired depressions may result. Excess scar tissue and lumps are possible as well. Please go over all risks with your surgeon at your consultation and your pre-operative appointment. You should be given a pre-operative information packet that explains everything you should do and know before your surgery date. The packet should include a list of all the medications you should not take starting usually at 2 weeks before your surgery. These medications will include, but are not limited to, aspirin containing products, stimulants, seratonin supplements, etc. Would you like to view a typical Medication & Supplements List? We have a printer-friendly version as well. Also, if your surgeon advised that you may take Arnica montana, Bromelain, Vitamin K, etc. for swelling and bruising you should either have this in your packet or begin shopping for your necessities. It is quite possible that you will have "blood work" performed. This is normally an extra out-of-pocket expense that the patient must participate in to check your white and red blood cell count and check for disease or disorders beforehand. If you are a female they may take an extra vial for a pregnancy test. Some surgeons ask that you have physical. This can be yet another out of pocket expense so ask at your consultation what will be needed when you are quoted a price. So many things to do... so little time. Surgery will be here before you know it so visit the Preparing For Surgery page and relax. This section contains, printer-friendly pre-op lists, tips and advice as well as things you must do to prepare for your big day. You may be groggy from the anesthetic and or oral medications and probably won't remember much of the first day or two. You will have to take it easy and sleep on two pillows to keep your head elevated for about 14 days - or however long your surgeon suggests. A recliner is the best for this. PLEASE KEEP YOUR HEAD & NECK STILL. Do NOT turn your head from side to side. MOVE YOUR WHOLE BODY, if you must move. When you wake up you will notice that your lower face and neck will look even more swollen in the first 3 days. You won't usually be extremely swollen until late that night or the next day and then the third is by far usually the worst. But, as the days go on the swelling will dissipate. There may be a lot of bruising, but this will go away, as well. So make a mental note of this or you may be shocked into a depression. Bruising and swelling are a normal occurrence in most surgeries. Don't worry, it is all a part of the natural healing process. You shouldn't really look at yourself in the mirror, but rather have your partner or nurse care for you instead (even take photos if you wish it). Although any discomfort should be alleviated by your prescribed pain medication if you have excessive pain, redness, pus or other symptoms that do not appear normal, contact your surgeon immediately! Take your temperature regularly. An elevated temperature could mean an infection. Take those antibiotics on time. Also, don't forget if you are a female taking birth control pills that some antibiotics can interfere so in the event that you do have relations, use another form of protection as well. Your back will more than likely cramp up from not being able to lie completely stretched out and flat on your back so some patients prefer heating pads or hot water bottles. Remember not to sleep while using any of these devices. This can result in severe burns - especially if you are heavily medicated and don't feel the heat or pain. « Back to "Cosmetic Surgery"